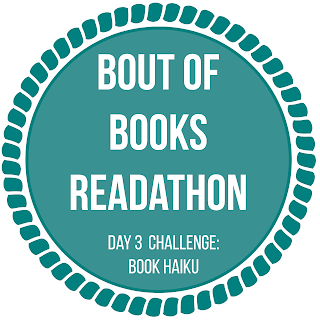 I’ve hit Day 3 of the #BoutofBooks 13 Readathon, and I like today’s challenge quite a bit: write a haiku about whatever book you’re reading right now. I don't want to toot by own horn (toot-toot), but not only does my haiku capture the essence of the book, but it sums up my own personal philosophy in 3 short sentences. Thank you to Bout of Books and Kristina Horner for organizing such a fun challenge. How are you doing with the readathon? I’d love to see your haikus. I'm not done with it, but so far, I highly recommend it! Thank you, Cynthia! Are you partaking in #BoutOfBooks? Go ahead and toot that horn... Your haiku was wonderful. Much MUCH better than I could do. And I am in total agreement with that little part that says Now just be quiet. I'm reading.